This is the altogether rather wonderful 'Coldstones Cut' a public sculpture by an old friend, Andrew Sabin. It is in Nidderdale, north of Harrogate, and abuts the (still working) Hanson Limestone quarry. I like quarries myself, but many don't, thinking they scar the earth and so on. 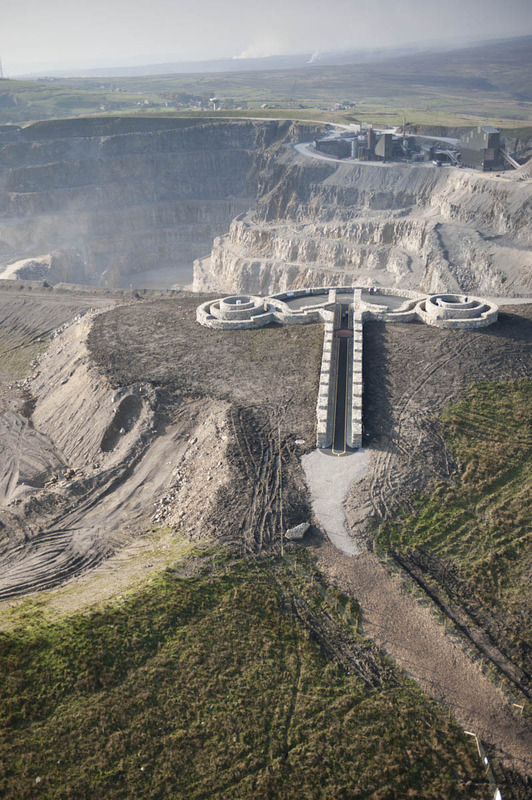 What I think Andrew's sculpture does is to reunite the quarry with the landscape. The shape of the 'Cut' brings to mind at once all those diagrams of the female reproductive organs in our children's biology text books. Of course the number of connotations thereby attaching is great but rather than enumerate I'll let you do the work yourselves. I mean, it could be seen as a symbol of the fertility of the earth or of quarrymen or of industrialists, etc etc.. Conception, birth, dum de dum, and so on and so forth. The important thing is that it is rich in its suggestion of connection. It is also beautiful, even as it echoes the forms it looks over, ameliorating them, healing the scarred earth. It lends dignity to the undertaking. Isn't it great when modern art is beautiful without being merely decorative?